When you buy a bag of ice, it isn’t uncommon to have a polar bear on the bag. The magnificent polar bear is the official symbol of Conservation, but it is also the unofficial symbol of crystal-clear ice. The Inuit Natives of Greenland even have a polar bear god named Tornaurssuk. This god’s spirit is powerful, as is the polar bear. Polar Bears Bring Excitement to the Cold! When going to a zoo, the majestic white bear is often surrounded by onlookers, excited to see them swim and play. The polar bear is celebrated on February 27 in the US on National Polar Bear Day, as well it should be. The polar bear is an animal worth celebrating. Some simple facts from the Defenders of Wildlife about the polar bear are pretty amazing! Males are approximately 8-9 foot tall, nose to tail. Gestation is about 8 months, with litter sizes of usually 1 or 2 cubs…but up to 4. The cubs are about 12-14 inches long at birth and weigh around one pound. Cubs stay with the mother for just over 2 years. Polar bears are actually blue, but appear white due to their hollow fur. Their coloring disguises them from being detected while they hunt and protect their young. When a polar bear gets dirty, it rubs and rolls across the snow to get clean again. A clean bear is an insulated bear. Mostly solitary animals, they hunt and gather alone rather than in groups. 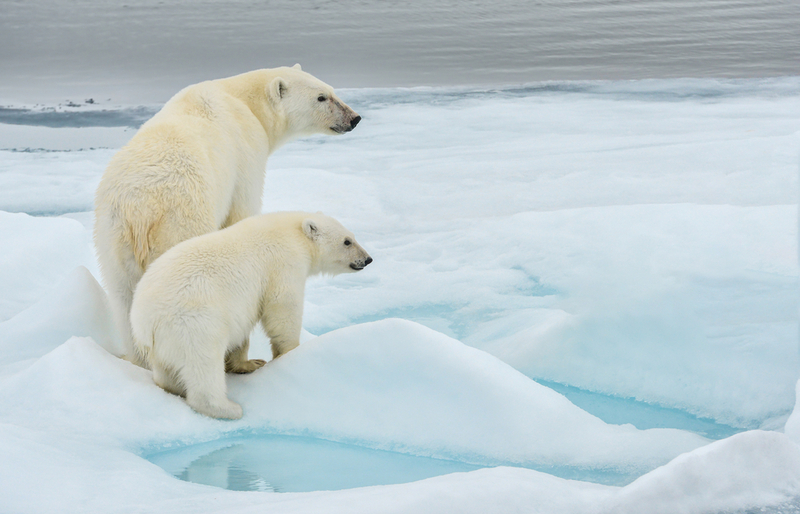 Polar bears don’t have territories, but instead, have home ranges where they hunt alongside other polar bears. Even though they are bears, they are considered marine mammals. They are the only bear that depends on the ocean to survive. While they don’t prefer ice to land, they need sea ice to survive. The bears reach their prey, the seals, from the platforms of sea ice. A polar bear’s paws are impressive, measuring almost a foot across. They help the bear walk across thin ice, extending their legs far apart to distribute their weight. Also, there are soft bumps called papillae on the bottom of the paw pads which grip the ice and keep the bear from slipping on the ice. Remember the days when you would “Eskimo kiss” as kids by rubbing your noses together? Well, it should have been called “polar bear kiss” because polar bears ask one another for something like food through a nose-to-nose greeting. This greeting gives one bear permission to share a carcass. The world has many names for the polar bear. According to www.polarbearsinternational.org, indigenous people, poets, and different tribes have all had names for the great white bear. Nanuk, Pihoqahiak, Tornassuk, Beliy Medved, Isbjorn, God’s Dog, Old Man in the Fur Cloak, and the White Sea Deer are all names for the polar bear. The polar bear is praised for its strength and wit; it is respected. Isbjorn is the name from Norway and Denmark, meaning The Ice Bear. Seems perfect! Celebrate The Ice Bears With Emergency Ice! Need some ice delivered to your next event? Reach out to Emergency Ice to schedule a delivery that is guaranteed to keep your event “chill” as the temperature starts to heat up. Contact us to find out about delivery services in your area.